Local art centres get ready to show off their TALENTS! As part of their fundraising efforts for the United Way of Winnipeg, the multi-talented people of Graffiti Art Programming (GAP) and Art City are teaming up for the fifth year in a row to put together their annual talent showcase. The TALENT! Variety Show isn’t your run-of-the-mill talent show. There will surely be the usual musical acts, of course, but you can also expect to see—as Josh Ruth, managing director at Art City puts it—some unconventional, “bizarre-o” entertainment. The list is endless. Some artists have put their skills to the test, creating art in front of the audience within a short time span. “[We’ve had] a sort of dress that someone made out of clay during the event,” says Ruth. They’ve even had staring contests. “It’s a real mixed bag,” he admits. Art City and GAP are happy to collaborate in fundraising for the United Way. “Graffiti Art Programming and Art City are both United Way agencies, and we’re friends with each other. We decided it would be fun for us to put on an event where we could have fun and we could hang out and get together and do something interesting. And we’re putting the talents that we have to use, and we can give back to the United Way with the money that we raised from the events,” says Ruth. Being a United Way agency means a lot, says Ruth, because the United Way provides operational funding. This type of funding allows for more flexibility between the organizations’ projects and helps to cover administrative and operational costs, which aren’t covered by project grants. Being a United Way agency also gives the organizations more credibility. “The United Way has a rigorous system for agencies to apply. When someone sees that you’re a United Way agency, it tells them that you’re financially responsible, that the work that you do is successful, that you meet the criteria of the United Way, and that you have that sustainable funding. So it really allows [our organization] to raise more funds [for our projects],” Ruth explains. Likewise, Louise Waldman, director of communications at the United Way of Winnipeg, says that supporting non-profit organizations like Art City and GAP is important to them because of their ability to connect with the community by providing services and programs that help people to be all that they can be. The organizations provide accessible art programming for the community, allowing youth to develop their creativity in a safe environment. “We’re proud to support organizations [like Art City and GAP] with stable funding so that they can focus on delivering the incredible and innovative programs and services they do,” says Waldman. The TALENT! 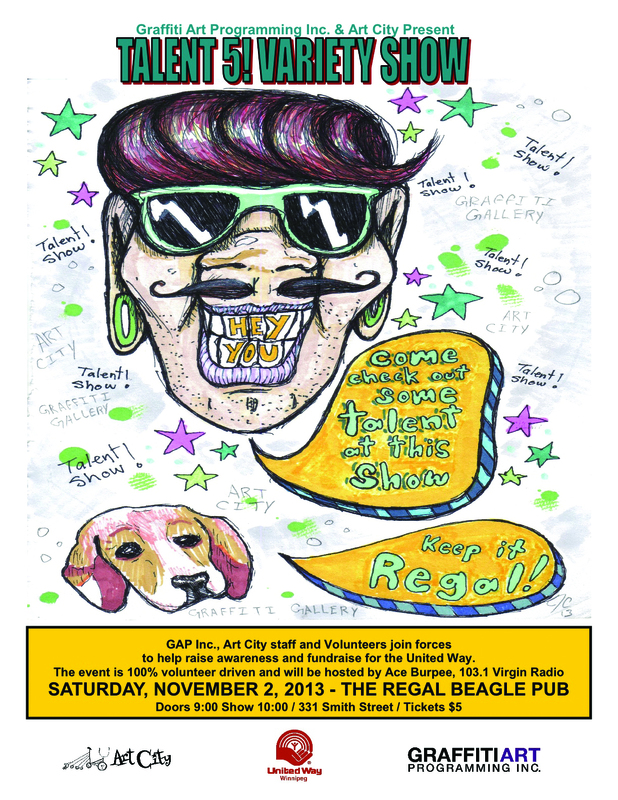 Variety Show is an 18+ event and will be held at the Regal Beagle Pub, 331 Smith Street on Nov. 2. It will be hosted by Virgin Radio personality Ace Burpee. Doors open at 9:00 p.m. Tickets are available at either Art City or Graffiti Gallery for $5.